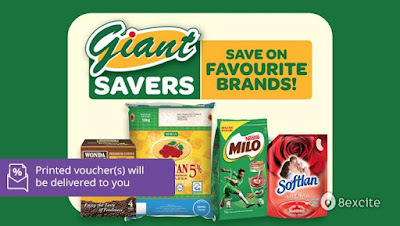 In Malaysia, Giant is synonymous with everyday low prices, big variety and great value and recognized for offering the most vibrant, comfortable and complete shopping environment. Giant, which turned 65 in 2009, pioneered the concept of modern supermarket shopping – buying everyday groceries, fresh produce and fresh foods under one roof and in a hygienic environment. As the pioneer, Giant sets the pace and standards for the industry with innovative marketing, store design and product pricing and variety. During the redemption of goods, if the value of the goods exceeds the amount stated in the voucher, the difference thereof will be paid by the bearer. Giant Malaysia shall not be held responsible for the loss or damage of this voucher and any of the losses or damages suffered by the bearer of this voucher that arise from or in connection with the loss or damage of the vouchers. Vouchers cannot be exchanged for cash, or any other forms of legal tender. Giant Malaysia reserves the right to vary and amend any of the above terms and conditions without prior notice.